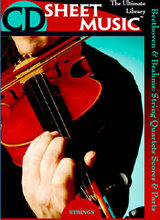 This collection makes available performing materials for nearly all of Haydn's works for string quartet. This collection makes available full scores and parts for string quartets by 19th century Slavic masters Dvorák, Glazunov and Tchaikovsky. This CD contains performance materials for 45 duos, over 1,200 pages of scored music for two Violas, Viola and Violin, and Viola and Violoncello Included also are articles on the composers and relevant entries from the 1911 edition of Grove’s Dictionary of Music and Musicians. This collection brings together works for solo cello from the Romantic & Early Modern periods. This collection brings together works for solo cello from the Baroque & Classical periodsn including both solo works and study pieces.